What Is a Court Messenger or Courier? A courier is a messenger, but not necessarily of verbal communications. He carries something — documents or goods — from one party to another. A legal courier or court messenger typically transport legal and other documents or evidence, often between a lawyer and the court or between law offices. He might work independently, for a law firm, or seek employment with a courier service. Legal couriers pick up and deliver documents and packages that are often time sensitive. A lawsuit is typically a maze of deadlines, most ordered by the court to prevent cases from dragging out for extended and unreasonable periods of time. Documents and packages cannot be delivered by U.S. mail or even by overnight delivery services like Federal Express when time is particularly of the essence — documents must sometimes be delivered with that day's business hours. Legal couriers have an obligation to beat deadlines when their services are called upon. 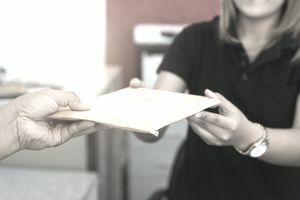 They often deliver items a law firm is unwilling to entrust to other means of delivery, such as highly sensitive evidence or confidential case information. Legal couriers may even run miscellaneous errands. In some cases, they may be called upon to actually file documents with the court, negotiating the labyrinths of courthouses to safely and timely deliver pleadings to the proper court division and return filed copies to the law office. Most entry-level legal couriers need only a high school diploma, a driver's license, a clean driving record, and nerves of steel. Innovation and the ability to think on your feet is a must. Imagine taking custody of documents that must be filed with the court by 4 p.m. and running into a logjam of traffic at 3:50. Training for this and other eventualities is typically acquired on the job, but some things can't be taught — they require a certain mentality. Post-secondary educational institutions can't teach you the layout of your local courthouses or the least-trafficked routes between attorneys' offices. It tends to be a learn-as-you-go profession, but it helps if you're deadline-oriented and have good interpersonal skills. You'll be dealing with people at both ends of your routes, and they'll often be as harried and time-pressured as you are. A smile and a calm, pleasant demeanor can go a long way to success. Employment as a legal courier or court messenger is a great way for law students to get their feet in the doors of law firms. Working as a legal courier can help you gain insight into many law firm processes. You'll become familiar with court filing procedures and personnel. Court messengers spend much of their time alone, waiting to pick up deliveries, and they're not usually supervised very closely. You may have some spare time to catch up on your studies between errands. But not all legal couriers want to be attorneys. If the idea of being tied down to a desk or workstation is somewhat off-putting to you, and if you thrive on occasional challenges, you may do well in this field.